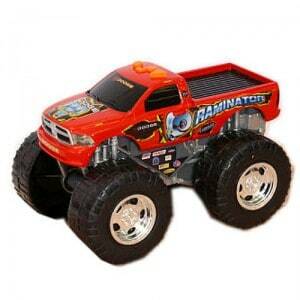 When my six year old son was three years old his uncle had given him a “Raminator” Monster Truck toy for Christmas. It instantly became his all time favorite toy thus began his enduring love affair with monster trucks. He played with it so much that it finally wore out and we have been searching for a similar one ever since. We were so excited to discover Wheelie Monsters by Road Rippers® which has an identical Ram Raminator toy. Adam leaped up and down with joy when he saw this toy and then he pulled me aside secretly and said, “Mom, Jacob is four years old now and I think it is time that he has his very own Raminator toy….can I surprise him and give this to him for Christmas?” I was so proud of my son for wanting to share the joy that this toy brought to him with his little brother. Road Rippers® Wheelie Monsters are action packed monster trucks that are motorized (battery operated) and it even includes lights and authentic sounds as it moves forward. Designed for ages 3 and up, I am very pleased that Wheelie Monsters are age appropriate for younger children to maneuver too as they simply have to touch the buttons on top to activate the announcers, wheelie action, music sounds and light. There is even a virtual world for computer savvy kids to continue to the action online at mymotorisland.com. You are invited to visit the Road Rippers® website to check out the entire selection of action packed toy vehicles including monster trucks, motorcycles, cars, rescue vehicles and more. “Ladies and gentlemen, get ready for the main event!”…………………………let the fun begin with Road Rippers® Wheelie Monsters! Road Rippers® are available for purchase at Target and Target.com with a SRP of $16.99. These would be great for my great-nephew & godson both 3 years and love anything with wheels.